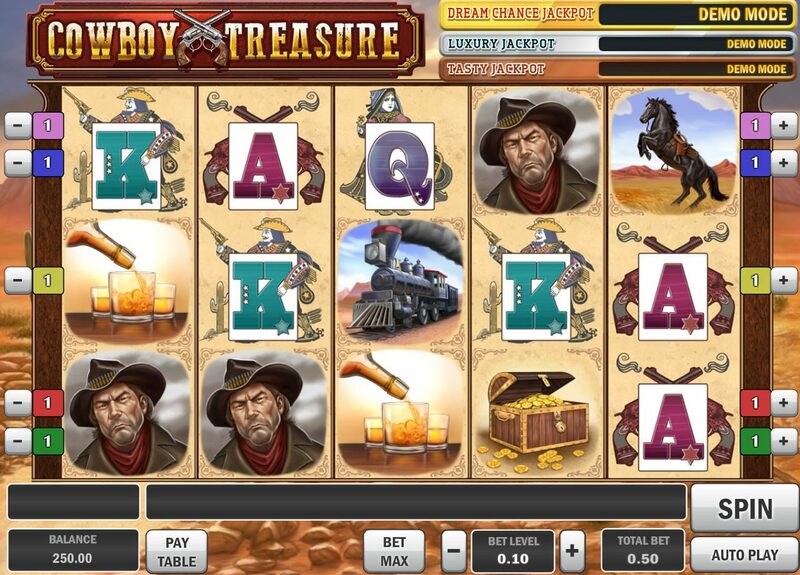 If you were raised on a diet of Saturday morning westerns and repeats of Bonanza on a Sunday afternoon, you should get a kick out of this Wild West-inspired slot from Play'n Go. Cowboy Treasure certainly kicks things off with a nice atmosphere: the backdrop behind the reels is a painted desert scene complete with cacti, stagecoaches and treasure chests. Meanwhile, over the top there's lovely soundtrack of Spanish guitars, spurs and bells, sounding like something straight out of a Sergio Leone film. The icons are just as exquisitely rendered in this 5 reel, 5 pay-line slot. So, we get a treasure chest full of gold, a horse, a bottle of bourbon, a steam train, an evil-looking gunslinger, and a sheriff. There are standard Jack-to-Ace card symbols, of course, but here they are really nicely drawn, particularly the Jack dressed as a gun-slinging bandit. The Sheriff's Badge is Wild in the game, and subs for all regular symbols other than the Bonus Scattered Gun. Re-Trigger up to 350 Free Spins! Here's where the bonus symbols comes into its own. Hit 3, 4 or 5 Bonus revolver icons and you will win 7, 9 or 14 free spins respectively. However, that's not all. Before you start your spins, you have to select either the silver horseshoe or the pile of gold coins. These icons will appear as stacked Wilds during the free spins, but also a tally will be made of how many of each land during the bonus round. If your selected icon was the most-landed of the two you will win further spins. This can keep re-triggering up to 350 spins in total. The 'icon race' is a really nice added extra to what could be a fairly generic free spins feature and is definitely something to consider if you're into your free spins. Finally, there are three progressive jackpots to be won in the game - part of Play'n Go's Dream Chance Jackpot series of slots. If you land three or more gold rings on the reels anywhere, you will have the chance to spin the Wheel of Fortune and try for the Tasty Jackpot, the Luxury Jackpot or the Dream Chance Jackpot. 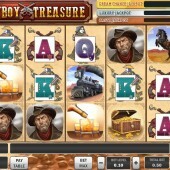 Wild West-themed slots usually do the business in the online world. With a free spins bonus that can potentially reap big rewards, plus three progressive jackpots, Play'n Go's slot is ahead of other games like Play'n Go's own Gunslinger game - just.